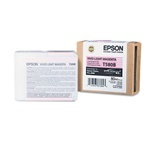 Epson T580100 Ink Cartridge, Photo Black 80 ml. Epson T580200 Ink Cartridge, Cyan 80 ml. Epson T580400 Ink Cartridge, Yellow 80 ml. Epson T580500 Ink Cartridge, Light Cyan 80 ml. Epson T580700 Ink Cartridge, Light Black 80 ml. Epson T580800 Ink Cartridge, Matte Black 80 ml. Epson T580900 Ink Cartridge, Light Light Black 80 ml.